Housing in Los Angeles is only getting more expensive, but many of the region's fastest-growing jobs pay less than $30,000 a year. That has the local business community worried. Will L.A.'s economy be sustainable if its workers increasingly can't afford the rent? A new report from the Los Angeles Business Council, led by USC public policy professor Gary Painter, finds that the high cost of housing is a big concern among L.A. employers. But with a few notable exceptions, most aren't doing anything to address housing costs for their workers. "For many, it is incredibly new to even think about housing as part of a compensation package," said Painter. "It really is going to take a new way of thinking about this — people need housing just like they need health care." The report surveyed 18 employers in L.A.'s three fastest-growing sectors: health care and social services, accommodation and food, and professional, science and tech work. The authors found some employers stepping up to offer housing assistance as part of their hiring and benefits packages. But that help was mostly missing for workers in L.A.'s booming low-wage fields. 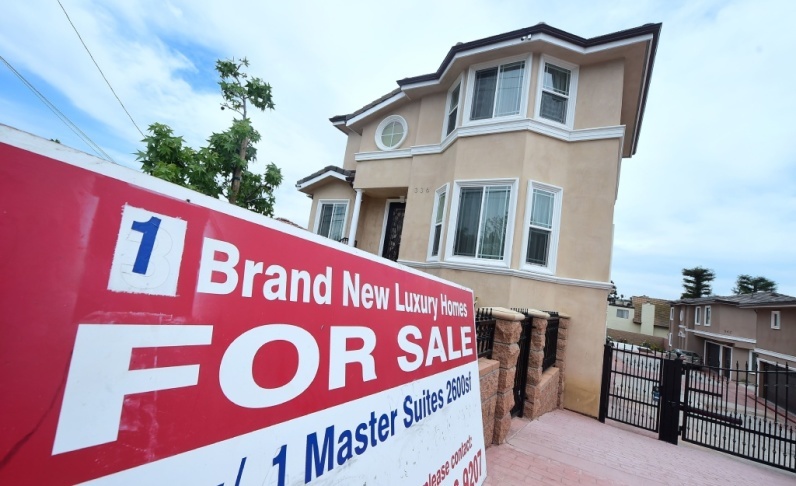 "We have a systemic problem, due to the success of our economic growth, that requires more thinking around providing adequate housing for people at the income levels they are receiving," said Mary Leslie, president of the Los Angeles Business Council. "Companies have to rethink their wage, and increase it. Or we have to rethink the kind of companies we're attracting to L.A.," she said. WHAT KINDS OF JOBS ARE GROWING IN LA? WHAT DO THEY PAY? First the good news. Local companies are hiring for tech, science and professional positions like web developers and statisticians. And those knowledge economy jobs are fairly well-paid. Most pay $50,000 a year or more, and about a quarter come with a six-figure salary. Like the rest of the country, L.A. has a large aging population. Many families are hiring health aides to care for their elderly or disabled parents in their houses rather than sending them to a nursing home. But in-home health work isn't well paid. The median annual wage is only $22,600. Tourists continue to flock to Los Angeles, and they're creating many new jobs in hotels, restaurants and other attractions. But 69 percent of tourist workers are making less than $25,000 a year. L.A.'s growing population means more mouths to feed. And that means more jobs for restaurant cooks and food prep workers. But those jobs often pay minimum wage, or close to it. Close to a third of LA renters are putting more than half their income toward rent, which can force them into cutting back on other necessities like food and medical care. Many workers are living in cheaper areas outside L.A. and commuting longer distances. Or they're doubling and tripling up with other roommates. Some are actually homeless. 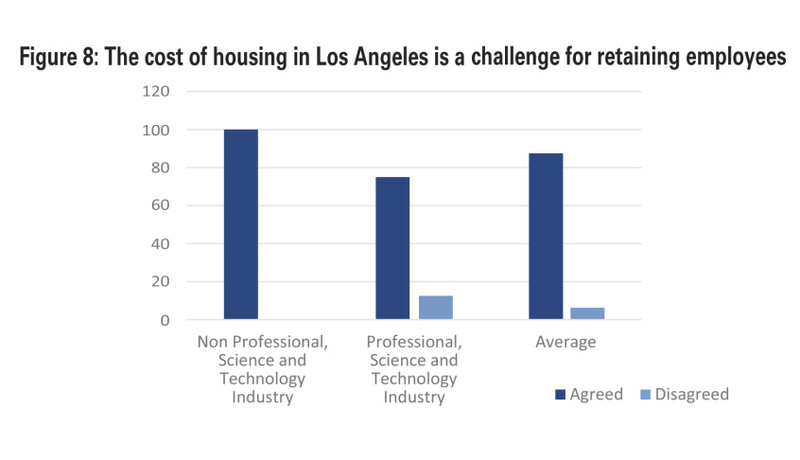 The report makes one thing clear: L.A. employers are worried about housing costs. More than 80 percent of surveyed employers said housing is making it hard to retain workers. More than a quarter said they've failed to attract employees to L.A. because of expensive housing. But 61 percent said they have no programs to help workers ease financial burdens around housing. Nearly a third said they don't even incorporate L.A.'s cost of living into their hiring packages. The report cites Snapchat and Spotify as two tech companies that have provided housing and relocation assistance for their L.A. workers. USC offers certain employees up to $50,000 in mortgage assistance when they buy a home close to campus. And while most low-income workers are not getting help with housing, some LAUSD custodians and cafeteria workers are now living in affordable housing units built by the school district. The report notes that other employers can help by simply getting more involved in advocating for new housing development near their offices. But USC professor Gary Painter said he was a bit surprised to find that employers weren't doing more. "One of the disappointing things in the survey is how little people were thinking and planning forward, despite the fact that everyone agrees it's a critical issue," he said.